This manuscript was misidentified for centuries. Probably made in Paris about 810-820, it is a copy of the 5th-century 'On the Apocalypse' ('In Apocalypsin') by Caesarius of Arles, although it was mistitled as being the commentary by Augustine of Hippo--possibly an attempt to elevate its intellectual clout but probably just passing on an earlier manuscript's error. By the 11th century, it was at St Augustine's, Canterbury, possibly one of the manuscripts brought from the Continent to upgrade Anglo-Saxon monastic libraries. Theologians at St Augustine's would have used it in their Bible study, and it is possible that scribes would have studied its beautiful, clear handwriting as a model to bring Anglo-Saxon book art in line with international styles. Parts of it may have been read aloud during the monks' daily prayer services since hymns and prayers were added to it in Canterbury. Nevertheless, the librarians who inscribed titles in it continued to identify it as St Augustine's commentary. 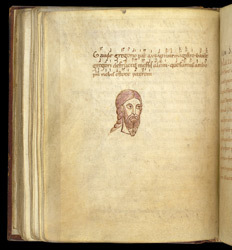 On the last page of the section of added prayers and hymns, an artist has drawn a head, perhaps meant as a portrait of Gregory or Augustine of Canterbury, who are mentioned in the hymn above. The drawing probably was made about the time the prayers and hymns were added, in the third quarter of the 11th century. The hymn is specific to St Augustine's. It praises Gregory, who sent Augustine (of Canterbury) to convert the Anglo-Saxons at the end of the sixth century, and has musical notations above its verses.